Summer has officially come to an end, so thought I would post a "Summer Season Finale" recipe that fully embraced the fantastic flavors I've enjoyed cooking with over the last few months! 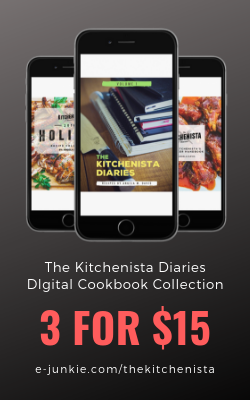 Don't be intimidated by the picture - this is an incredibly easy dish to get on the table and you'll swear you spent good money at restaurant instead of making it yourself. This dish was inspired by the gorgeous view of the ocean and refreshing mojitos I enjoyed in the Florida Keys a couple weeks ago! My company is celebrating our 75th anniversary this year, and our South Florida office was treated to a stay at the beautiful Hawk's Cay resort. I had an amazing time relaxing in the sun and of course, partying with some great people. Unfortunately, the fish taco lunch I had at our resort didn't come close to living up to my expectations, but it did get me thinking about the perfect summer meal to match my surroundings. 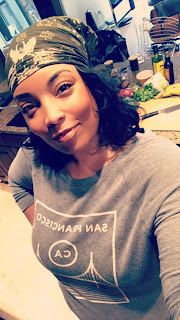 As hung over exhausted as I was upon returning home Sunday afternoon from a fun-filled weekend at the resort, I couldn't wait to get in the kitchen. Lately there have been great deals on extra large raw shrimp at the local grocery stores, so I picked up a pound of shrimp, fresh mint, and a couple semi-ripe plantains. Surprisingly I still had a good amount of coconut rum left from the weekend festivities, and everything else needed were things I regularly keep stocked at home. I opted to skewer and cook my shrimp on the good ol' George Foreman grill, but you can easily do this in a skillet for similar results. A pot of coconut rice and black beans were all we needed to complete this delicious, summer-inspired Sunday dinner! 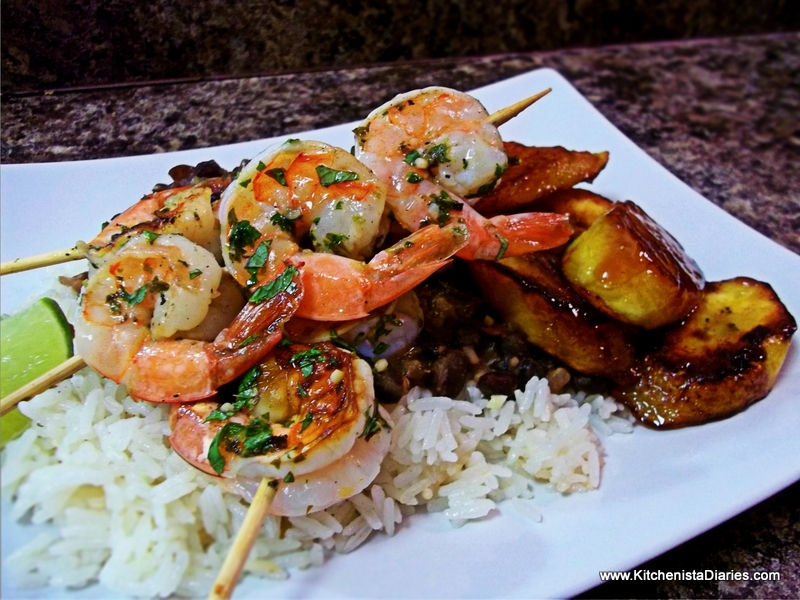 If you are serving rice, beans, or other sides it's best to start those first as the shrimp and plantains don't take long to cook at all. To make the glaze, dissolve the brown sugar into 3/4 cup of the coconut rum over medium heat. Bring to a low boil, then simmer until the liquid reduces by half. After 5 - 7 minutes or so, you'll know the glaze is thick enough when it coats the back of a spoon. It should be the consistency of maple syrup. 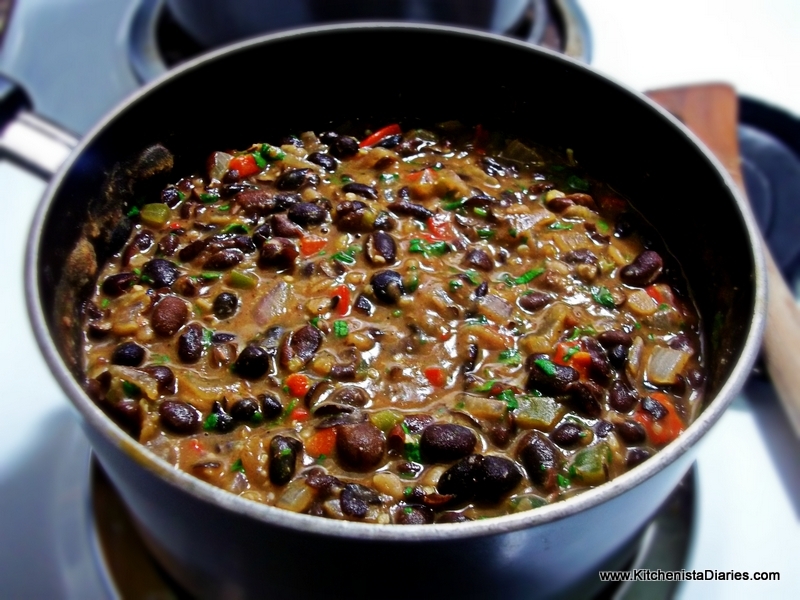 Remove from heat and set aside; it will thicken slightly as it cools. While the coconut glaze was cooking, I used the time to prep my remaining ingredients and heat my grill. Chop your herbs, zest your limes, and skewer your shrimp if you haven't already. My apartment was a little cooler than usual that day so my coconut oil was in solid form - it doesn't take long at all to melt in a warm kitchen though. To make the mojito marinade, combine 2 tbsp coconut oil, 1/4 cup coconut rum, mint, cilantro, garlic, lime juice and zest in a small bowl. Whisk well, and season with salt and pepper. 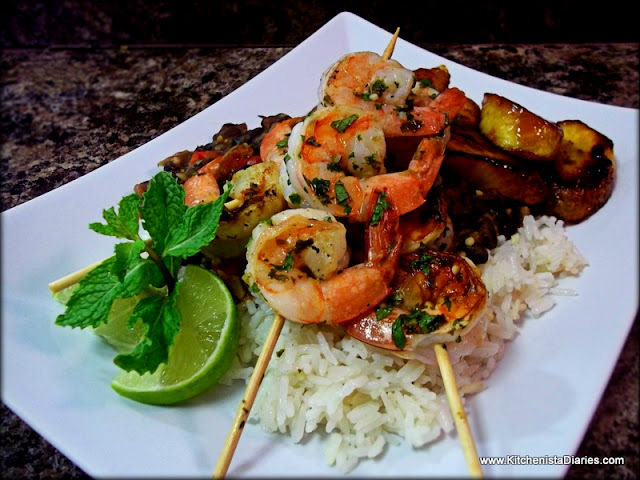 Pour the marinade over the skewered shrimp, and allow to marinate up to 15 min, turning frequently. If you are not grilling your shrimp, they can simply be added to the bowl of marinade and tossed to coat well. Typically I would advise you to soak your wood skewers in water prior to using (to avoid burning) but with such a quick cooking time on a George Foreman Grill, I skipped that step this time and didn't have any issues. 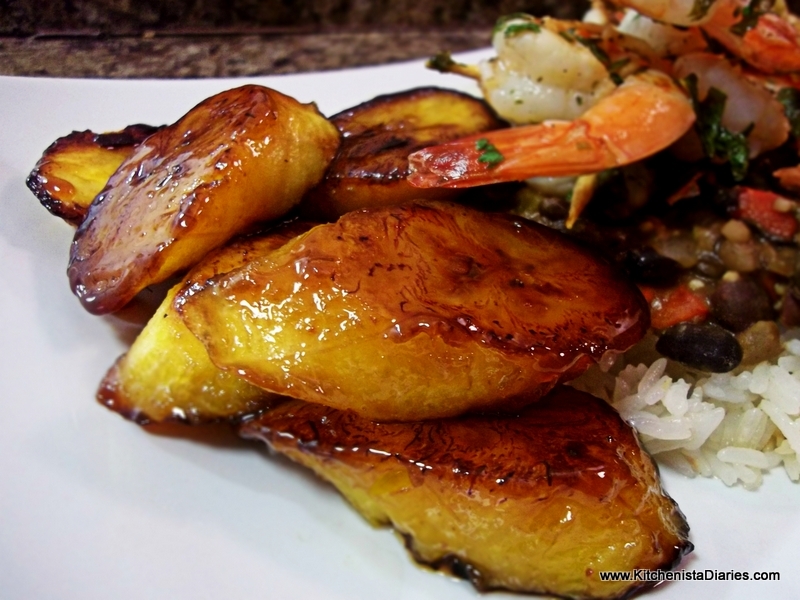 The plantains can cook while your shrimp marinates. Slice them on a bias, approximately 1" thick. Am I the only person who doesn't use plantains that are so ripe the skin is black? I think when they're just starting to get ripe, they are still sweet, but also firm enough to slice easily and don't have to be deep fried. In a skillet heated to medium high, melt 2 tbsp coconut oil. 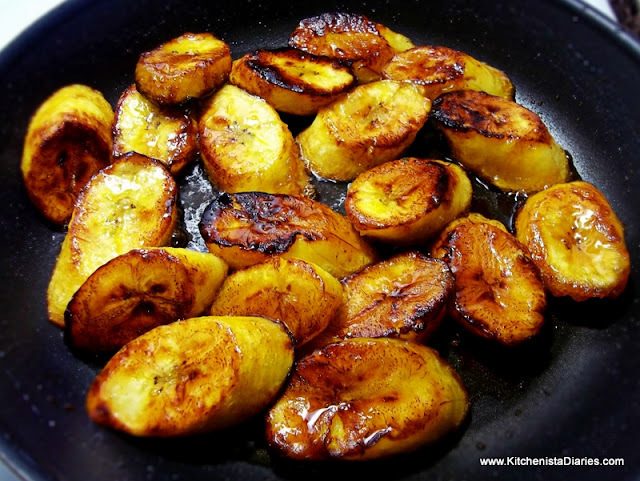 When the oil is hot, add the plantain slices. Cook about 4 minutes before carefully turning them over to cook on the other side another 2 -3 minutes or until golden brown with crisp edges. The smell of plantains cooking in coconut oil, like most anything else, is amazing! Reduce heat to low and drizzle 2 - 3 tbsp of the coconut rum glaze over the plantains just before serving. That's it! I told you this was an easy one. If you're cooking in a skillet, heat it to medium high before adding your shrimp. Cook 2 minutes before turning them over to cook on the other side, and add a few tablespoons of coconut rum glaze to the pan in the last minute of cooking. The first time I made this, I just used my George Foreman Grill. Since there is already coconut oil in the marinade, I didn't brush the grill with any other oil. I just placed my skewers on the grill and cooked 2 minutes on each side, basting with the coconut rum glaze as they cooked. I closed the grill just for 30 seconds or so towards the end to get a little bit of a caramelized sear on the shrimp. I'm really picky about shrimp being cooked just until done, and not a minute longer, so if the intent is to serve them hot you really should have your plates ready to go before you cook the shrimp. They only take a few minutes to cook and nobody wants overcooked, rubbery shrimp, so serve right away. Not that these aren't great cold too, if you wanted to add them to a nice salad! How amazing do these plantains look? I didn't think plantains cooked in coconut oil could get any better until trying these with the coconut rum glaze. Candy-coated heaven if you ask me! Yes, it's a lot more sugar, but unless you're eating these all the time there's nothing wrong with indulging once in a blue moon. 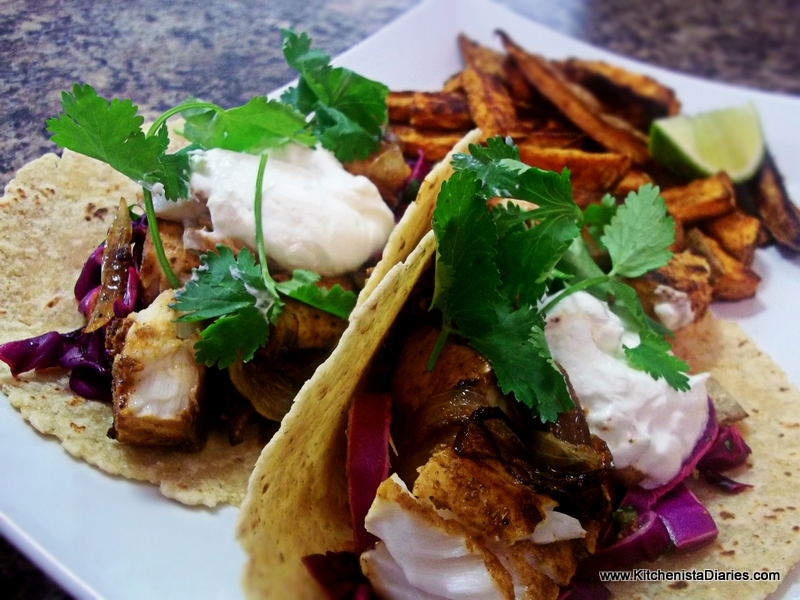 I debated whether or not to post my "go-to" fish tacos recipe. Then I read this disaster of an article on what constitutes a "real" Baja-style fish taco and decided to weigh in. If you've followed my blog for any length of time, you know that I love to get creative with my tacos. I'm all for it. 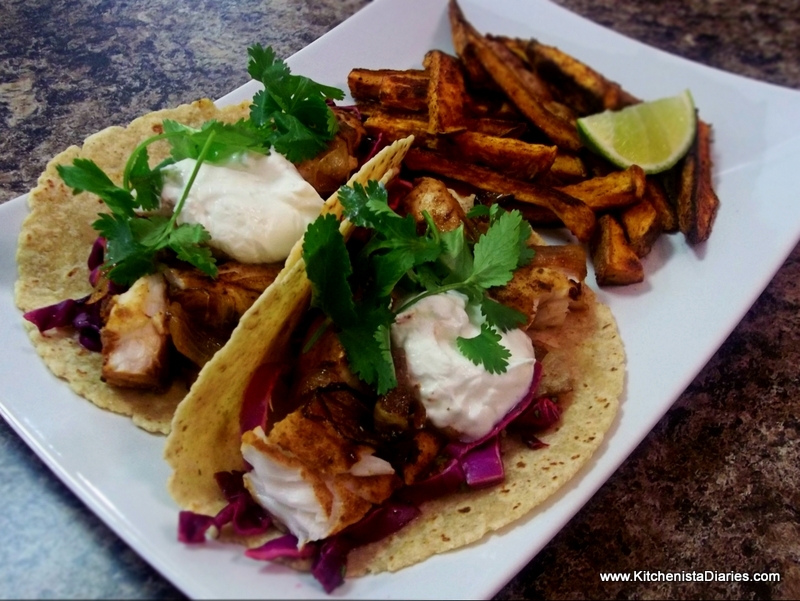 I even wrote a post on ways to branch out with taco recipes while staying healthy. I disagreed with the author's stance of non-traditional salsas or seasonings (bring on the mangoes), but then I saw that her own ingredient list included Sriracha and had to laugh at the hypocrisy. Whatever. My real issue with the article is that there is also absolutely NO requirement that fish needs to be batter dipped and fried to constitute an authentic baja-style fish taco.I also don't see the point of using mayo, Mexican crema and whole milk to make a white sauce. Not only is that overkill on ingredients, but Greek Yogurt does the job just fine without all the extra fat and chemicals. Nonsense like that is why American diets are tragically unhealthy. 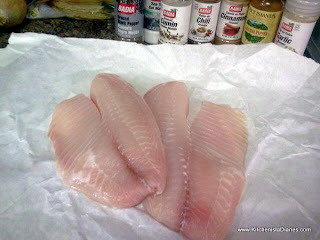 No need to fry fish this fresh! One thing I think the article did get right is the "Holy Trinity" of the fish taco - white fish, cabbage slaw, and a creamy white sauce. My fish tacos are true to that, without all the grease. This is what I usually have in mind as a boilerplate recipe before I start getting creative with ways to kick things up. And because the Tilapia, cabbage and tortillas are typically the only thing I need to buy fresh, this is easily a meal I can do for $10 or less. Fish tacos are one of those meals I can always throw together without thinking much or a lot of prep time. My son asked me the other day, "Mom can we just have a normal dinner that doesn't take 2 hours to make?" (Mind you this is the same kid who asked for lamb chops for breakfast last week. I can't keep up.) Anyway, he had a point so I obliged. Fish tacos are family-friendly, quick to prepare, and simply delicious without a lot of fuss or effort. Tilapia doesn't need a long time to marinate so I usually just start by seasoning my fish and letting it hang out in the fridge until I'm ready to cook it. Slice the fillets into large chunks and season with garlic powder, cumin, chili powder, cayenne, cinnamon, and the juice of a lime. Season as lightly or liberally as your taste dictates, it's pretty hard to screw this one up. I usually make a pot of rice and beans to go with my tacos, but since I had half of a huge sweet potato left from another dinner, I sliced it up, tossed with coconut oil, seasoned with the same spices and popped the pan into the oven to make baked sweet potato fries! To make a quick slaw, add the diced jalapenos, chopped cilantro and zest of one lime to a bowl of shredded cabbage. Red cabbage has been ridiculously cheap lately, so I've been buying a whole head of it and shredding it ahead of time. It can easily stretch two or three meals this way and stays fresh in a Ziploc bag or other sealed container. Now, I didn't shred the cabbage too finely for that reason since I didn't know how I planned to use it but I love how the bigger pieces add a bit more of a crunch to the taco. I usually make a dressing for my slaw with some variation of lime juice, vinegar, oil, and if necessary a sweetener. For the purposes of writing a recipe I indicated measurements, but as with anything else it's important to taste your own ingredients and make adjustments as you go along. In this case, I mixed together the juice of 1 lime, tablespoon of rice wine vinegar, a couple teaspoons of honey and a splash of coconut oil. The sweetness gave a nice balance to the diced jalapenos and cabbage. Toss the slaw with the dressing, season to taste with sea salt & pepper, and set aside. My healthy substitution for sour cream is simply Greek Yogurt mixed with a squeeze of lime juice and a dash of sea salt. How easy is that? I deviated a tiny bit from my standard recipe and sauteed my onions first in a little bit of coconut oil. Usually I toss them into my slaw raw, or don't use them at all. Whatever works for you. My son said he likes the cooked onions better and I think I agree with him on that! Over medium high heat using about a tablespoon of coconut oil, sear the fish chunks for 2-3 minutes each side until the fish turns opaque and begins to flake. Season with a good pinch of sea salt and pepper. You'll also want to heat your tortillas in a small ungreased skillet or warm them in the microwave, per package directions. Spoon some slaw into a warmed tortilla, add a few chunks of fish and onions, top with a dollop of yogurt and garnish with fresh cilantro. Now that's my idea of good eating!